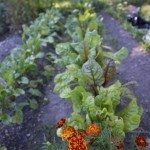 If you do not have adequate space for a vegetable garden, consider growing these crops in containers. Let’s taking a look at growing vegetables in containers. Most vine crops, such as squash and cucumbers, also do well in containers. Generally, compact varieties are the better choices for growing in containers. Bush beans, for example, thrive well in this type of environment and look quite attractive when arranged with other container crops. Nearly any type of container can be used for growing vegetable plants. Old wash tubs, wooden boxes or crates, gallon-sized coffee cans, and even five-gallon buckets can be implemented for growing crops as long as they provide adequate drainage. Regardless of the type or size of your container, drainage is vital for successful growth and the overall health of vegetables. If the container you have chosen does not provide any outlets for drainage, you can easily drill a few holes in the bottom or lower sides. Placing gravel or small stones in the bottom of the container will help improve drainage as well. You may also consider raising the container an inch or two off the ground with blocks. Depending on the crops you selected, the size of the container will vary. Most plants require containers that allow at least 6- to 8-inch depths for adequate rooting. Smaller sized containers, like coffee cans, are generally ideal for crops such as carrots, radishes, and herbs. Use medium sized containers, such as five-gallon buckets, to grow tomatoes or peppers. For larger crops, such as vine growers, beans and potatoes, you want to implement something more suitable to their needs, such as a large wash tub. The spacing requirements for most vegetables are usually found on the seed packet or you can find them in gardening resource books. Once the seeds have sprouted, you can thin the plants to the desired number suitable to the container. Fill containers with peat moss and a suitable potting mix. Compost or manure should be worked in to achieve healthier plant growth. Do not add more than the recommended amounts of fertilizer, however, since doing so can burn the plants. Once you have taken care of the basics, you’ll have to decide where to place your container garden. You want to situate the containers in an area that is close to a water source with sufficient sunlight, usually, at least five hours. Excessive wind can quickly dry container plants out, so you should consider this factor as well when choosing a site. Set the larger pots furthest back or in the center, if your design permits, with the medium-sized containers placed in front or around the larger ones. Always place the smallest containers in the very front. With containers, there is also the option of growing vegetables in windowsills or hanging baskets that can be placed right on the porch or balcony. Ornamental peppers and cherry tomatoes look good in hanging baskets, as do trailing plants such as the sweet potato vine. Keep them watered daily, however, since hanging baskets are more prone to drying out, especially during hot spells. Generally, you should water container plants every few days unless it is quite hot; more frequent watering will then be required. Check containers at least once a day and feel the soil to determine whether or not it is damp. You also might consider sitting containers on trays or lids. Doing so will help retain moisture by holding excess water and allowing the roots to slowly pull it up as needed. Check these plants often to make sure that they are not continually sitting in water. If sitting water becomes a problem, fill the trays with some type of mulching material, such as chips, to help soak it up. Apply water with a watering can or sprayer attachment on a garden hose. Also, check that the water is reasonably cool beforehand, as hot water may cause damage to root development. During the hottest part of the day or when severe weather is expected, you can move the containers for additional protection.